Albion is proud to finally be able to offer a faithful recreation of an historical sword named after its owner, Swedish Viceroy and knight, Svante Nilsson Sture. This sword has been thoroughly researched and documented by noted swordsmith Peter Johnsson, and with his help and guidance, the talented artisans at Albion are pleased to bring you an heirloom-quality recreation of this unique and breathtaking sword, destined to become a collector's item. This was a time of shifting loyalties and fragile alliances. During the years of the union between Denmark, Sweden and Norway, many battles were waged and towns and strongholds burned. The seat of power wavered between the Danish court and strong noble families in Sweden who preferred a Swedish regent on the throne in opposition to the union. 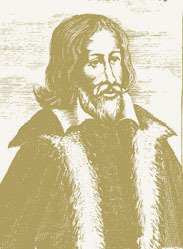 Svante Nilsson Sture became a major player in this struggle and fought on both sides of the conflict, sometimes supporting sometimes opposing the Danish claim of the Swedish throne. Being a member of the high council from 1482 he was finally elected Regent of Sweden at the death of his old adversary, the powerful and dynamic Sten Sture the Elder in the year 1504. Svante Nilsson Sture is enigmatic and fascinating: shrewd politician, bold warrior and struggling diplomat. From him we have a legacy of one of the finest late medieval fighting swords in existance in Sweden today. The original rests in the museum of Västerås Cathedral, where Svante Nilsson Sture was buried in January, 1512. The sword of the viceroy is unique. 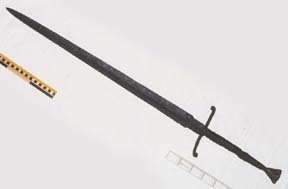 When Svante Sture's grave was opened in 1958, during a restoration of the cathedral, this sword was discovered with his body. 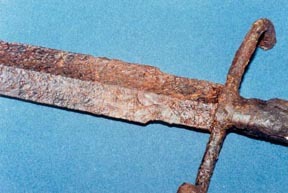 It is one of very few swords that have been found in Swedish medieval graves, let alone that of a prominent historical person. 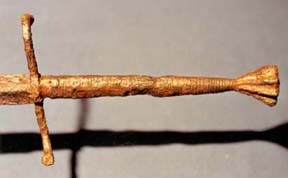 It is also an important find from an international perspective, in particular because of the unusual shape of its blade. 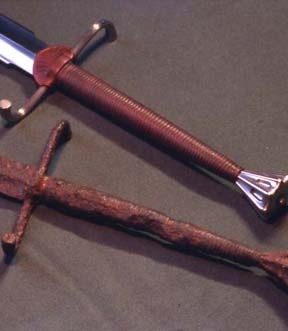 Even though the sword is now in part badly corroded, it is clearly a high-quality weapon of war. It has a total length of 117.5 cm and weighs around 1.8 kg. The grip is long, giving ample space for both hands. However, with a point of balance some 9 cm from the cross, it handles well with one hand only. Stylistically-related swords are most frequently depicted in art from the 1490s to the mid-1520s. One close parallel might be the sword of St. George in a woodcut by Lucas Cranach the Elder, from 1506. In The Disputation of Saints Erasmus and Maurice by Matthias Grünewald from around 1520, a crossbowman in the background is girded with a hand-and-a-half sword, which shows interesting similarities with the sword of Svante Nilsson. A woodcut by Altdorfer from the first decade of the 16th century shows Emperor Maximilian I girded with a very similar sword. A few preserved weapons in various collections display similar features, making a dating of the sword to the years around 1500 probable. 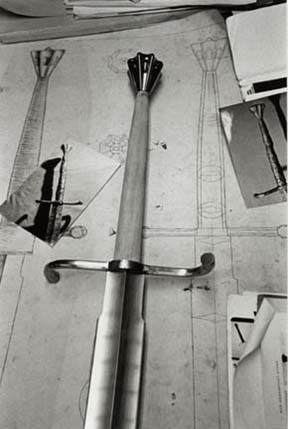 The sword made in the workshops of Albion is a direct result of a project Peter completed as his degree thesis. 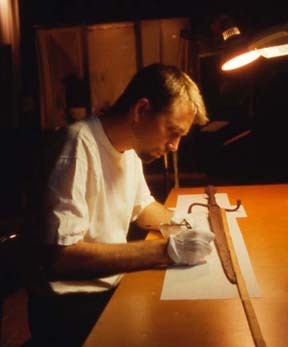 Peter set out to forge an exact reconstruction that was to be the basis of a published study of the original. The knowledge gained during this project is now resulting in a faithful and highly realistic reconstruction made by the skilled artisans of Albion. No effort is spared to make these swords true to the original, not only in dimensions but also in performance and aesthetic details. The blade is 1075 steel, hand-ground and finished to a high satin finish. The broad edges are deeply hollow-ground. Each blade is individually heat treated by hand for maximum flexibility and cutting performance. The wooden core of the grip is bound with cord and covered with leather, with a hand-made tooled leather chappe (rainguard). The "S" shaped cross with its gently flaring ends and the fluted pommel are both investment cast from waxes hand-carved by Peter Johnsson, and hand-finished and mounted to fit the individual blade. Reservations can be placed with a non-refundable deposit of $500. Only a limited number of these swords can be made in the course of a year. 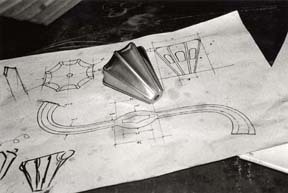 Swords will be shipped as they are completed, in the order in which they are reserved. Handmade scabbard designed by Peter Johnsson, in a style popular in the late 15th C.
For more information about the sword and its history, see this on-line version of the article from Warrior Magazine, issue #1. Back issues of Warrior Magazine are still available for purchase for $10 each. 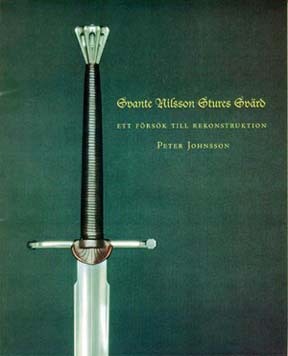 You can also see another full length photo of Peter's recreation and the original sword here.